We returned home today from a spring break 5 night cruise aboard the Carnival Holiday. 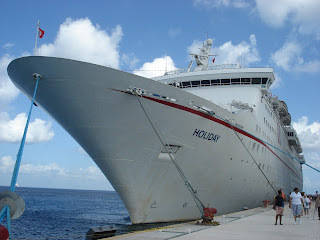 The Holiday sails from Mobile (Mo-beel), AL to two ports, Progreso and Cozumel, Mexico. 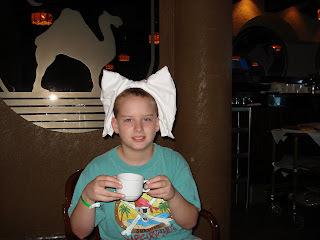 During the two "fun" days at sea they served afternoon tea in the piano bar. In the "fun" spirit of Carnival Cruise Lines, the server demonstrated a little napkin folding as you can see in the photo of AJ above. I snapped quickly before he saw what it was!